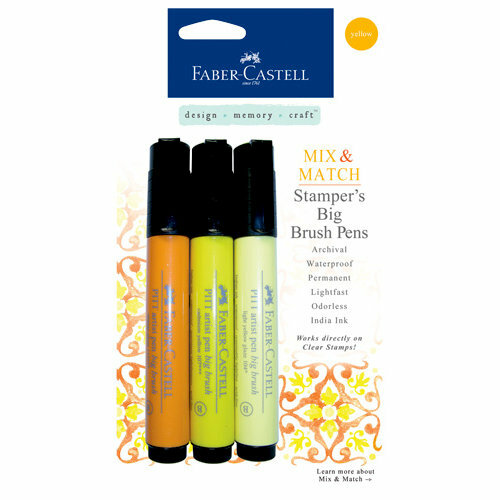 pinkpapercrowns: DCWV + Faber-Castell | Blog Hop! Hello crafty people!! It give me great pleasure to bring you some projects featuring two excellent companies! 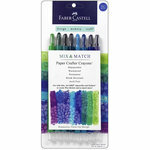 Are you ready for our first blog hop with Faber-Castell? We’ve been fans of their products for a long time so we’re excited that we’re finally doing our first blog hop with them. I love getting a little messy sometimes - even though I don't do it enough. I feel a real freedom when I pull out some mixed media supplies and I'm so excited to show you what I've come up with! I received some wonderful supplies to work with for this hop! First up, is a card that has LOTS of bold details and some great (and easy!) techniques. I like the grouping of elements on one side of the card which lets the dimensional background shine as white space. I couldn't stop playing, so I pulled out the canvas stack and decided to experiment! I love the diagonal design of this card. This card looks like I'm giving a piece of ART to the card recipient. First, I covered the canvas with Faber-Castell 'Gesso' (to give myself a good base to start with). I created some nice texture over the gesso with some 'Whipped Spackle' and let that layer dry. I applied lots of color using my Double Scoop Gelatos. I used a little water and my finger to blend some of the sections of gelato and left some sections more 'scribbly'. I used some mist to give the canvas piece some extra sparkle, even though the Gelatos have SUCH a beautiful shimmer. I hope you enjoyed my projects and I've inspired you to get your mixed media on! Take a look at all the other projects on the hop and then pull out some of your, 'inky-painty-misty-colorific' stuff and make art!! Britt - YOU ARE HERE!! AND, if you want to see more from me, please visit my FACEBOOK page, and follow this BLOG, and follow me on PINTEREST! Love the use of the stencil on burlap! Fantastic fun cards. I love the texture double whammy with the DCWV burlap and canvas with the whipped spackle. Love these. Love the spackle. Im loving all the butlap out right now. These are wonderful! 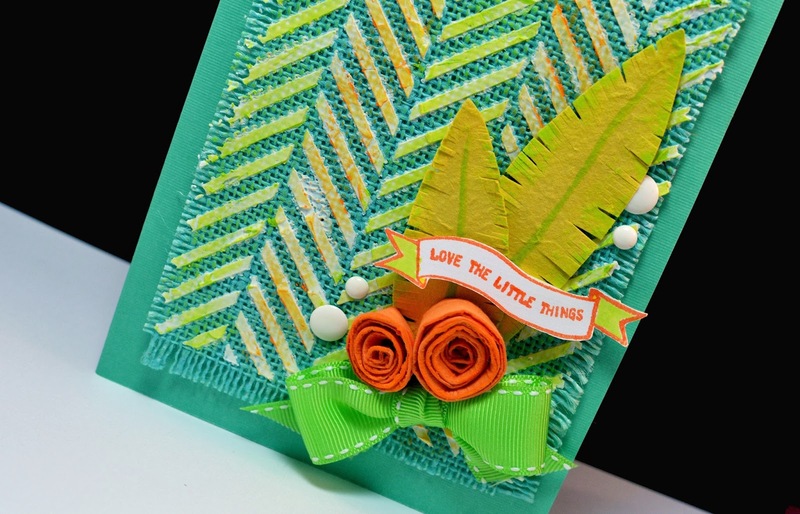 Love the feather card-the textures, colors, design is perfect!!! TFS! 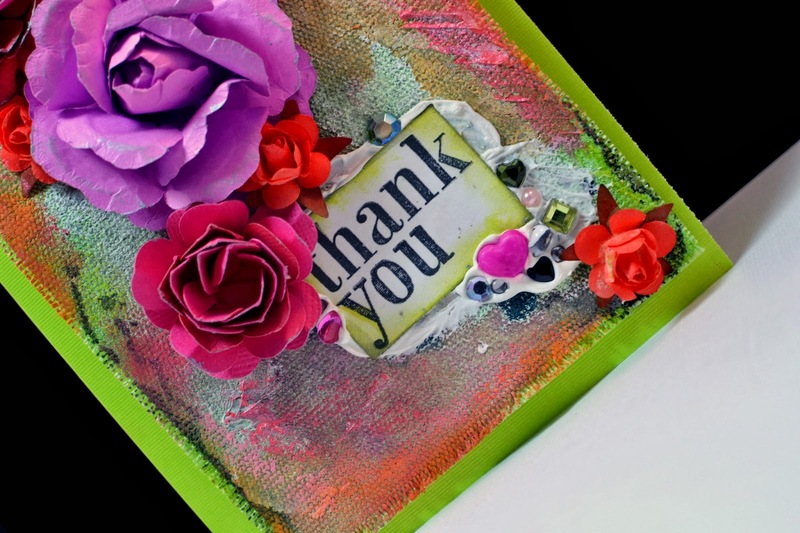 I am loving the combo of the texture from DCWV combined with stencils, spackle, gesso and beautiful color! 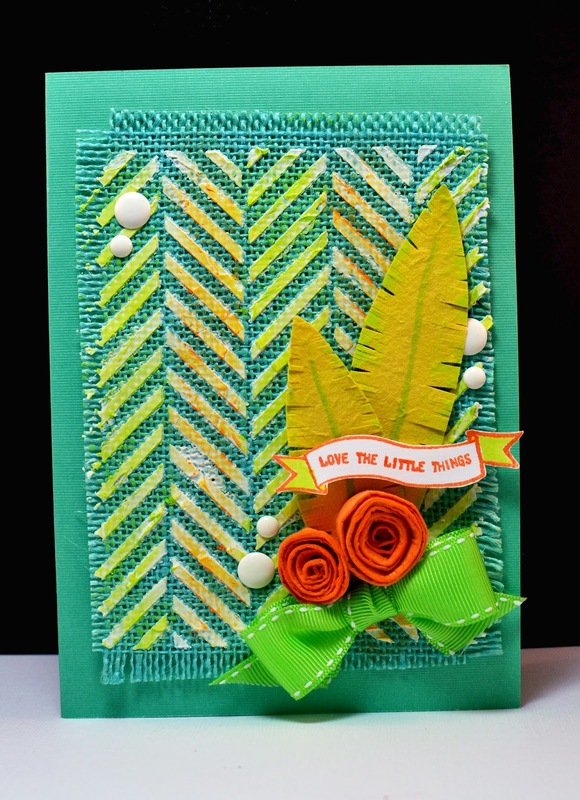 Your "chevron"-like pattern behind the feathers creates a great effect! Wow, I love the different looks you've created! 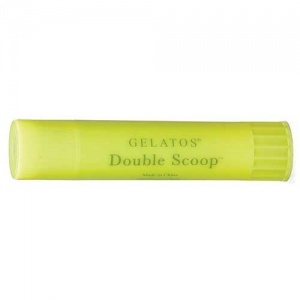 I've just started using gelatos and love them!! So fun! These are so fun! I still need to play with the spackle. Love the chevron on the burlap. Need some of those texture pads! So bright and colorful and such fun textures. Fabulous project! So fun. I need some of these great supplies to play with. Oh the colours on the flower card are just yummy! Love them both, the texture is pretty amazing. Artsy girls have got to have their Spackle! Love your projects. I just have to try the technique of paste, stencil, and burlap - it looks so yummy and texturized! Very pretty cards. I really love the first one and the way you did the chevron bg! Love this idea I need to get some Gesso. Love the burlap. It colored so nicely. The second project really pops. The flowers really make the project sparkle. I love your colourful cards! I Think I need to get some whipped spackle to play with too. Your cards just took me on a ride to happy town! I love the bright colors, the texture that whipped spackle adds, and your homemade flowers! Fabulous my friend! Beautiful cards. I love the texture on both of them. The stencil work is so neat. Wow Britt!! Love the bright colors and beautiful flowers. Wow!! I am loving this burlap and how well the gelatos r working!! I really like the feathers :) my favorite part! The cards are wonderful! I love the texture on the texture. Great cards! I'm having a great time on the blog hop! So many fantastic ideas! Thanks for sharing! Very cool cards, love them!! Thanks for sharing! I DID enjoy your projects. They look awesome. These are beautiful! I especially love the second card. Isn't it so fun when you just experiment/play and everything comes together? I thought I had commented on this before but I don't see the comment. You did a great job. So awesome! Love it all! I love the colors on both cards. Thanks for sharing! Great texture and color. Love both projects. Well done. I like your colorful cards with these products. love your canvas and flowers! Sweet! Love the texture and bold color! These are amazing projects. Love how you used the stencil in your first card, but the colors in your 2nd card are amazing and they are so well done. Thanks for sharing. BOTH cards are FABULOUS Britt!!! LOVE the colours and textures, such delicious colours & textures!!! Really cool papers and post! I always enjoy hoping over here Britt!, such amazing creations and wonderful technique and colors. Thanks again for always having some awesome projects and layouts. Really pretty cards and I never would have thought of using Gelatos on top of the embossing paste, TFS! Great card...like your stencil!! Like the creative canvas you made too...that spackle looks like fun to play with! Wow, these are gorgeous. I love the use of the stencils and whipped spackle on the first card and the gelatos on the second. Great techniques. Very cool cards, love the textures. Love your boldness! We all get in ruts with the same colors from time to time....its time to break out the boldness!! ha ha Thanks for the inspiration! LOve all the layers and the textures! I was definitely inspired. I LOVE YOUR FEATHERS! OMGosh...they are fabulous! I am a big feather fanatic and I am going to try to make them. Your canvas background is so awesome. I would love to try a stencil. Thanks so much for sharing with us! Those are so pretty! Love the colors and the awesome backgrounds! Love the cards, what sort of envelopes do you use? For cards like these, I usually hand deliver so that I don't have to worry about an envelope. If you really wanted to mail one, I'd put it in a little box, or make a dimensional envelope with my score board. I think there are some really good tutorials around the internet, if you do a little searching. Thanks! Great card and your flowers are so pretty. Beautiful cards! I love the vibrant colors and what you did with the burlap. Thanks for sharing. I'm totally in love with your canvases. Thanks for the inspiration! Wow! Gorgeous colors on both cards! Love the designs too! Love the herringbone design. I need to incorporate spackle into my cards and layouts! Your cards are AMAZING! I'm in love with that pop of white/color on the colored burlap and your use of color and texture on the second card! Wow, both your cards are amazing. Love the textures and brights colors. Thanks for sharing. Fabulous job. Great colors. Thanks for sharing. So cheerful! Love the technique ideas. Hi Britt, thanks so much for stopping by my blog! 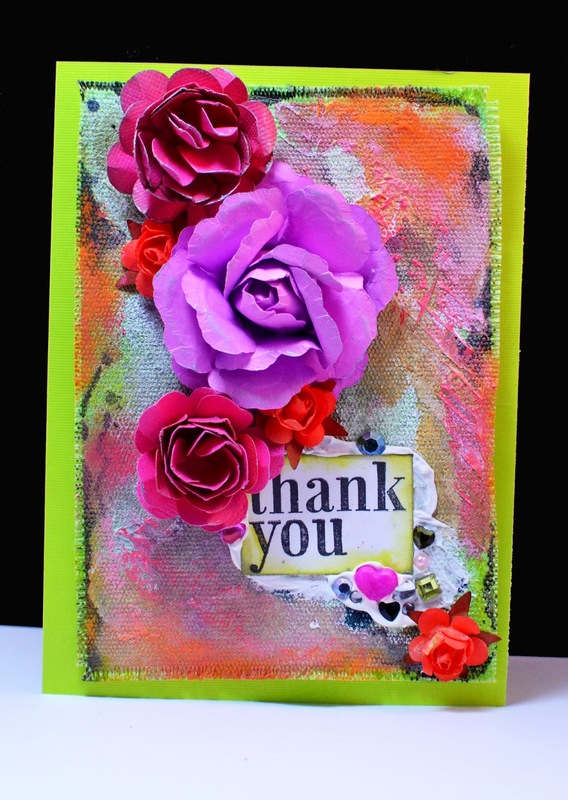 I'm loving your lovely colorful and textured cards :) Great job! 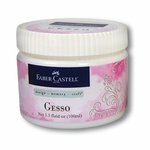 I have so been dying to try the gesso! This gives me the incentive to go for it! Thanks, Britt! Your cards are work of art! I just love the beautiful feathers and flowers. Great job, you are an amazing artist. Thank you sharing your work with us. Really love both card designs! Love your feathers on the first! And I love the background you created for your second card. Awesome job! Thanks for sharing. You've created two beautiful works of art. I can't blame you for playing with your new goodies because I'd be doing the same. I'm so glad I found your blog and I'll be back. Beautiful cards, love the techniques you used. Especially loved the stenciling. Stenciling and color on the texture looks so great. What a fun addition to a piece of art. Nicely done; thank you. Both these cards are fantastic, but I especially like the second one! The textures you've created with the DCWV canvas stack, the Spackle and the colours that you've used in the form of the Gelatos is really impressive! I love creating mixed media and I have been inspired by your work, so thank you! Wonderful cards! Love seeing the products used! Fun techniques! Thanks for sharing! Great cards. They both look like art. Thanks for showing us how you made them. Love the card with the feathers! You have put a little bit of everything in these two cards, color, texture, and creativity. I really enjoyed both of your cards. I'm so inspired to try these new to me techniques. Thanks for sharing how you created them. Gorgeous cards! So colorful. 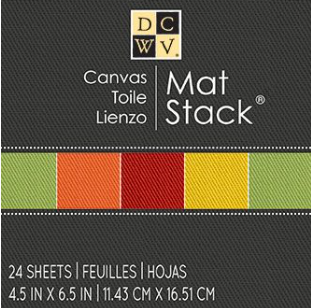 Now I have to get my hands on the colored burlap stack and the canvas stack! The painted burlap is spectacular the flowers!